One of the main things I’ve always wanted to see changed about the Zelda series is the level of detail the worlds in its games have. More so than some other adventure games I’ve played, Zelda has a tendency to have areas that feel… like they’re from a video game. I realize there are multiple confusing elements to that statement. The bottom line is that there’s usually two extreme kinds of video game: Arcade, and simulation. Arcade-style games don’t feel realistic at all, and instead they feel like they’re designed entirely to be a game. Simulation games mimic real life as much as possible. And then, of course, there’s everything in-between. Zelda has never been purely one or the other, but to me it’s always leaned more into the arcade category. I suspect this is one of the reasons for disliking the series for many of its critics: That its environments and characters and general interactions tend to feel like those out of a video game, with clipped dialogue and locations that feel purely like products of game-design and not a believable world, something that the adventure genre seems to be moving away from these days. I wouldn’t know if that’s the prevailing reason the series is criticized or not since I’ve loved the Zelda series since I got introduced to it, but I do know that, as a Zelda fan, this is one weakness I always felt could be improved without damaging how conducive the series always has been for just plain old fun gameplay. I’ll elaborate throughout this article and talk about how I would apply this additional detail — and therefore more believability — to three specific aspects of any Zelda world. I start with this because it’s the main thing that I hear other people talking about regarding this topic. The usual opinion that I see from time to time is that Zelda games should have more towns so the world feels more realistic and also just so you have… well… more towns to check out! Depending on the game and how big — or deserted — its world is supposed to be, I would agree. However my main point regarding towns applies just as well to one town as it does to several. The number of towns is a separate consideration and that, again, simply depends on what kind of world it is. The main thing is to construct the towns themselves to feel actually livable. A surprisingly uncommon trait that’s effortless to accomplish this with is to have some houses. This is something Ocarina of Time was pretty good at. 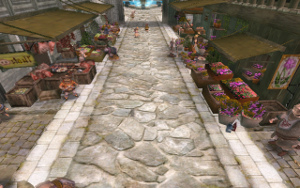 The Market didn’t exactly have houses but it had an abundance of buildings, and it was just the market of the town, anyway. Kakariko Village, Kokiri Forest, Gerudo Fortress, these all gave good indication of livable spaces, and even Goron City accomplishes this with its many alcoves and the fact that the Gorons seemed pretty comfortable curling up and just sleeping pretty much wherever. Zora’s Domain was weird and felt more like something of a community pool but it’s really the only bad example in the game. Twilight Princess also came close to nailing this, barring the homes of the Gorons and Zora. But many other games have very odd towns that do not feel believable, or at the very least not that realistically detailed so as to feel like something you might see if you visited that location in real life. It’s a problem that’s especially present in the 2D games, but still happens with a few towns in Ocarina of Time and Twilight Princess, as I said, and multiple other 3D Zelda games. The only believable settlement in Majora’s Mask is the admittedly awesome Clock Town; none of the other races have very complete homes. Really the series should just make some more effort to make the towns feel like real places that people live in. The right number of houses or at least livable chambers is a great start. The series has gotten some other things right, like shops, discernible government at least in the form of an elder who’s like, so old that everyone listens to them, and so on. The rest involves additional landmarks and buildings for flavor, things that might not necessarily serve a strict utility for the player — although they could be made to pretty easily, especially for sidequests — but that help make the town feel real. A jail, an inn, a town fountain, stables, the major’s house. Several towns in the series have done all of these things, but you don’t always get a fully-believable town that has all or enough of them, apart from a number in the two games I mentioned. Of course less of these notable buildings would be found in small villages where you might just find normal houses, but in larger towns these details would help make everything seem more real. In a big way this ties into the towns, because the settlements where people gather to live are usually where you find people! A lot of times in the Zelda series characters will just sit around saying the same things. If they’re part of a sidequest, then you can help them at some point if you have the right item or have completed the right tasks beforehand, and if it’s nighttime maybe they’ve disappeared until day. In a similar vein as some of the towns in the series, some of the characters don’t feel like they’re there for any other reason that to talk to the player and perhaps give them a task. They don’t feel like actual parts of the world. Of course this was never an issue in Majora’s Mask, where the characters had their own schedules and there were detailed sidequests involving their daily lives. 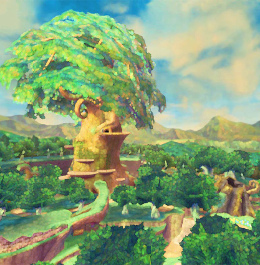 And it was also somewhat diminished in Skyward Sword, where several of the main characters had their own missions they worked on during your quest while the lesser NPCs, in an attempt to mimic Majora’s Mask, would at the right points in the game behave as though they had suddenly developed an interest in let’s say catching bugs on an island, or have some new problem all of a sudden which you can miraculously just now solve since you got the right item in the last dungeon, and they have a reward all ready for you! How badly do you want a bottle that had some mushroom spores in it? These are definitely good ways to combat the problem. Certainly the character should not just stand around — not doing anything in particular — and say the same things all game. This issue can still be fixed even in games that are not side-quest focused, without most of the characters having to be involved in some quest later in the game. Simply having them appear to do different things at different times while being found in different locations, having dialogue that at least partially and sometimes reflects them having a daily life instead of only discussing hints or current events in the plot, or even just having them performing a regular task as they stand around doing the same thing all game (Piper at her job making soup, for example?) would all help. The only other thing to keep in mind is that this needs to be meshed with the towns and there needs to be enough of a town’s citizenry designed with this in mind, so it feels like a town where all of the people are off living their lives instead of a town of robots with a handful of real citizens. Finally I’d like to talk about the geography itself. Might seem like an odd thing to bring up, and it’s usually not too bad in some of the more recent titles like Twilight Princess or Skyward Sword, but it’s certainly something that Ocarina of Time messed up on. Remember going to Zora’s River and noting the frankly asinine rock outcroppings and platform placement? That’s always the area I bring up when I talk about Zelda areas that don’t feel believable at all. That place wasn’t a river. It was a LEGO block obstacle course. And there were other places like that in the game, as well as in its sister release, Majora’s Mask. Skyward Sword probably did the best at having good geography, because for all of its other overworld problems — and there are plenty — the layout within each of the main overworld areas is fantastic. Faron Woods is an excellent example. It doesn’t feel like running down a path with decorative trees on the sides, nor does it feel like a completely open field with trees interspersed throughout it to arbitrarily look like a forest. In fact it’s both at different times, among other things; it has variation and feels like a real forest. This is a part where it’s less about mimicking real life — which the recent games manage for the most part — and more about adding detail. While Twilight Princess is realistic much of the time, the areas are still not all that interesting. Faron Woods doesn’t have the flavor of a woods except visually, Death Mountain is a straight corridor, etc. What I’m asking for is for Zelda games to design their intervening overworld areas — not just the towns, or plot-sensitive locations, or dungeons — with a level of detail that makes them interesting, realistic, and believable all on their own. This probably sounds weird coming from me, since in the past I’ve talked about wanting to see more locations in Zelda that feel less like real-world locations, but the fact is that realistic detail and believability can be applied to fantastic concepts just as well as realistic ones. The unreal can still be realistic, can still be believable. Willing suspension of disbelief suggests that as long as something has a semblance of truth and interest, people will accept it no matter how fantastic it is. The worlds seen in Zelda games can feel less like those of arcade games and more like believable locations with just a little attention to detail, and I feel doing so would help to strengthen the player’s investment with the world itself. Their interest in exploring locations, the appeal of the characters and the world’s plights… all of these are things that would be stronger if detail were added to towns, characters, and the geography of areas. The levels of fun and charm that are reached by many modern Zelda games need not be diminished by the detail I’m asking for; why should adding detail ever cause there to be less of something? Instead the fun design of the games can be preserved, and around it, more detail erected for those who would enjoy it. The simple pleasures and the deeper details can co-exist just fine, so why shouldn’t they?